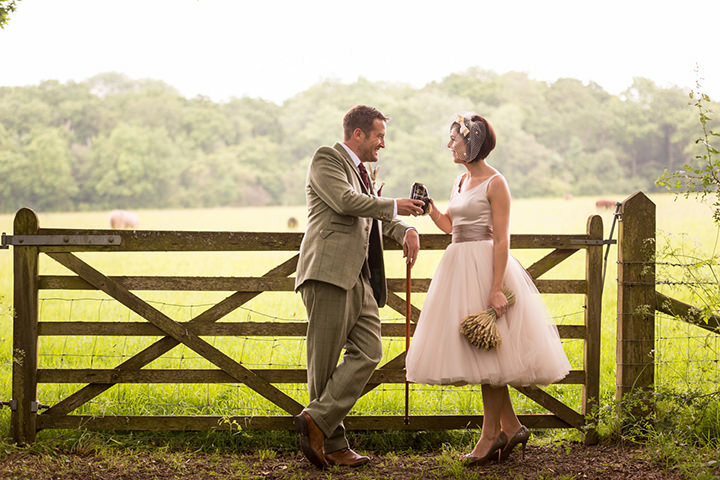 I have anther gorgeous wedding for you today courtesy of Tom Halliday. 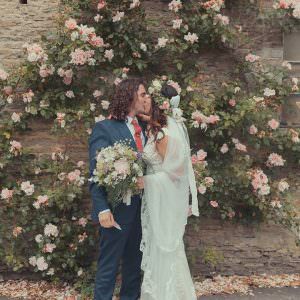 It’s the wedding of Rebecca and Harry who have pulled together a fabulous feast of vintage inspired loveliness, coupled with some amazing DIY projects. 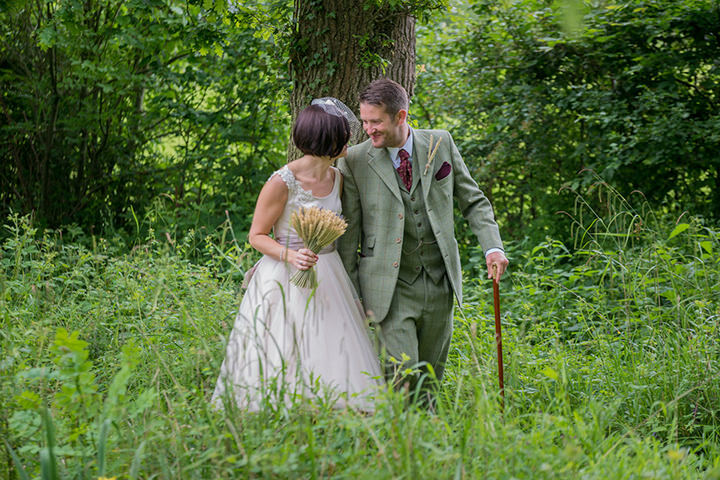 With a stunning Candy Anthony dress and a rather dashing vintage tweed suit, Rebecca and Harry are certainly a very stylish couple and lovers of anything with a vintage twist. 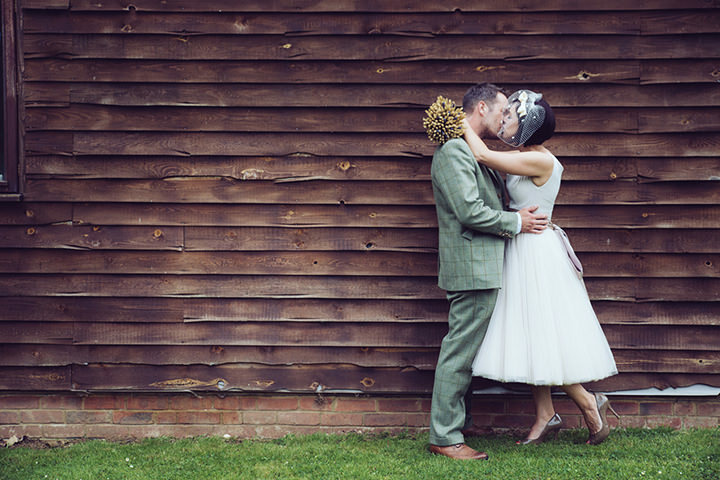 They had a good strong idea how they wanted their wedding to look and feel, and this they achieved with lots of research, lots of planning and lots of hard work. 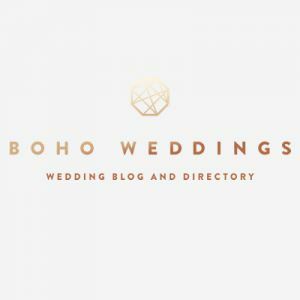 From the hessian bunting to the gorgeous bridesmaids dresses, the ice cream van to the amazing decoration, everything about this wedding is first class and just brimming with beautiful details. We met through our friend James in August 2005, on my birthday. Although we’d known each other for a few years prior to this we didn’t actually get talking until then. We’d always liked the look of each other but never had the opportunity to talk! (each time we met we were always in another relationship!). We went out with friends several times before we got together at my best friends new years eve party in 2006. Harry wasn’t even meant to be at the party there but he turned up (to my pleasant surprise) with James half way through the night. It was obviously meant to be! It was on Christmas day in 2011. Harry had hidden a Haribo jelly ring in a box in our chicken coop at the end of our garden. He asked me to collect the eggs first thing in the morning but the day was so cold and gloomy so I made excuses as to why I couldn’t go outside. We went to see his parents for the day and when we got home in the evening he was still asking me to go and collect the eggs. I eventually I gave in and went outside. When I opened up the laying box I found the ring. I felt so bad for making him wait all day! We designed my engagement ring using a diamond that was set in ring that had belonged to my dad and had it made by Elliott at The Diamond Shop, Hatton Garden, London (He also made my wedding ring). 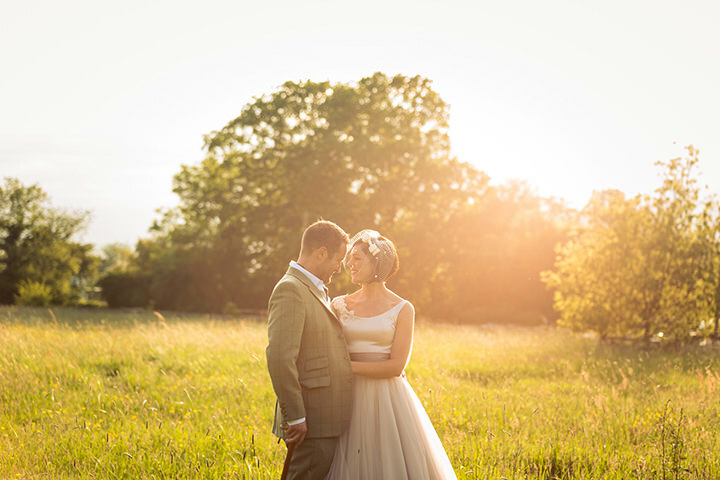 Our priorities were to have the perfect setting, to ensure both us and our guests had a day that they would never forget and photographs to tell the story of the day. 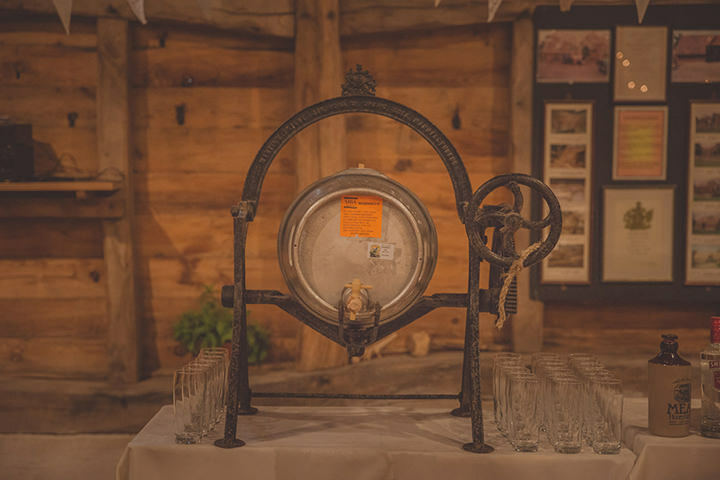 Our budget was therefore split between the catering, bar, venue and photographer. We were given a number of recommendations from friends. 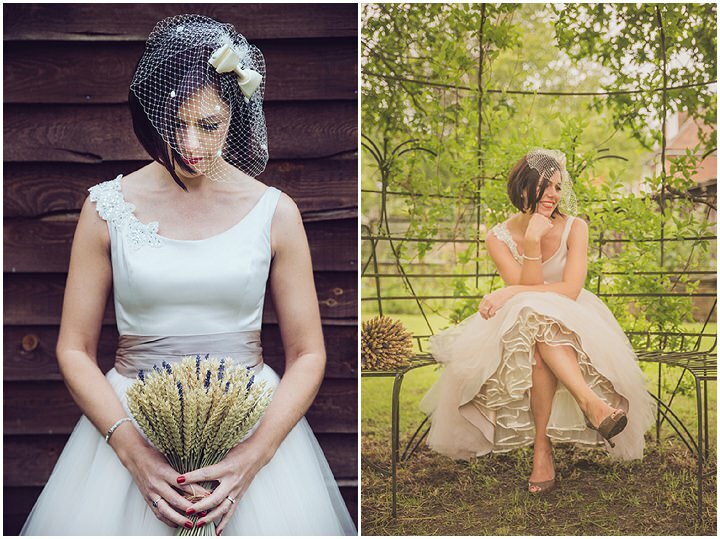 After initially contacting about 8 photographers we short listed a few whose work was a little out of the ordinary. We wanted something unique, something that stood out from other more traditional wedding photos. 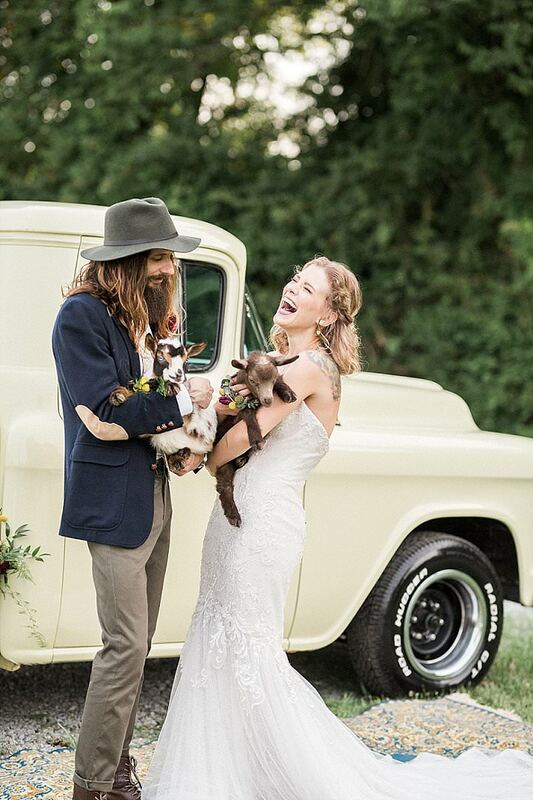 We wanted images that were fun and captured the real feel of the day. After looking at each website and portfolio we decided Toms was the one we liked the most. We met Tom and knew instantly we wanted him to capture our day. He not only made us feel comfortable but we had so much fun posing for the photos. He fitted into our day so well he felt like one of our guests and we were sad to say goodbye at the end of the evening! Neither of us usually enjoy being in front of the camera but after the day with Tom we’ve definitely changed our minds. He captured absolutely everything perfectly. 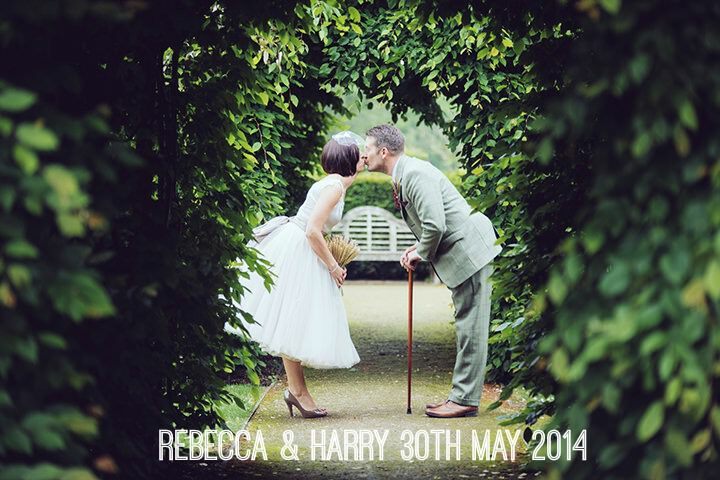 We felt privileged having him photograph and be part of our special day. 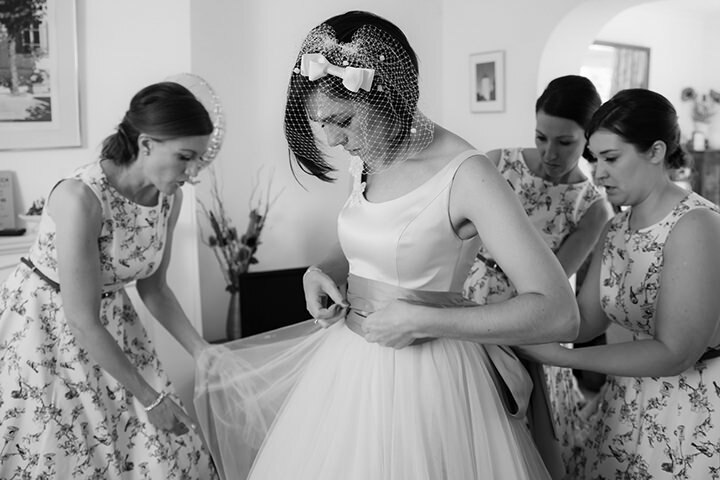 As soon as we got engaged I went dress shopping with my mum and bridesmaids. I tried on so many dresses but didn’t feel comfortable in any one of them. The last dress I tried on was just for a bit of fun, it was a 50’s style dress. The minute I put it on I knew I wanted this style dress. I was actually 11 weeks pregnant at the time so knew I couldn’t to buy the dress there and then. 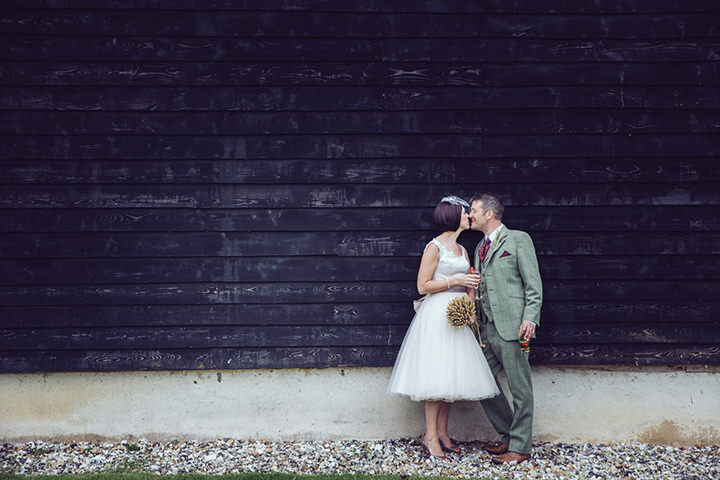 I started looking again at the beginning of this year as soon as we had booked the venue but having the 50’s style in mind and only 4 months before our wedding I was starting to panic. 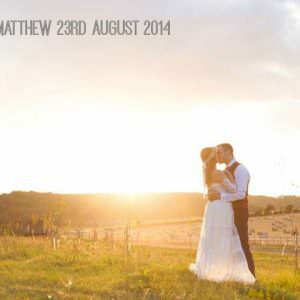 I searched online and found Candy Anthony where I made an appointment for the following day with my bridesmaid Helen. 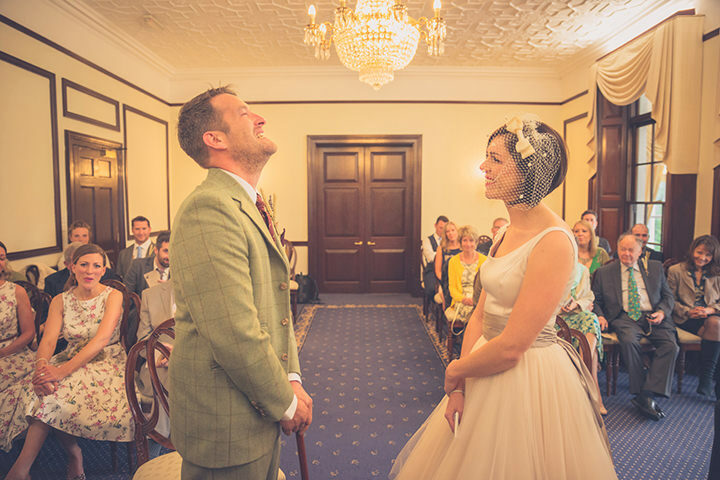 There I found my dress, it was obviously meant to be it fitted perfectly and the colour was exactly what I had in mind and even better it was also part of their sample sale so fell within my budget and I could take it away that day. I just loved wearing it so much. I already owned my shoes which were patent taupe peep toe platforms from LK Bennett. 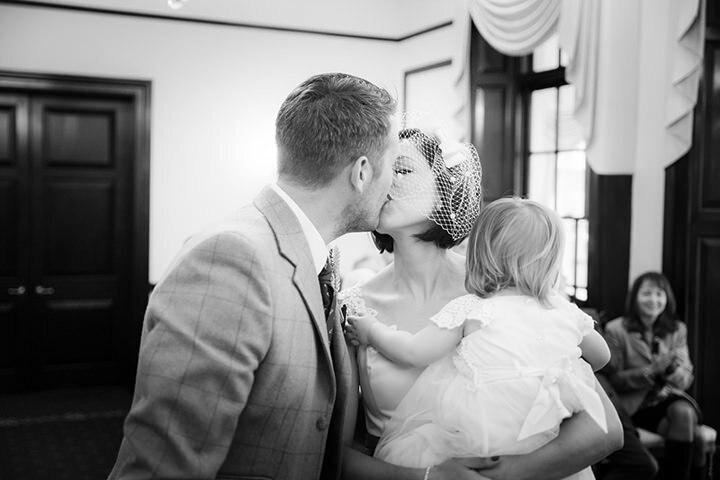 I bought a birdcage veil online from Lily Bella. I borrow a diamante bracelet borrowed from my bridesmaid Helen and bough my earrings from Ernest Jones. 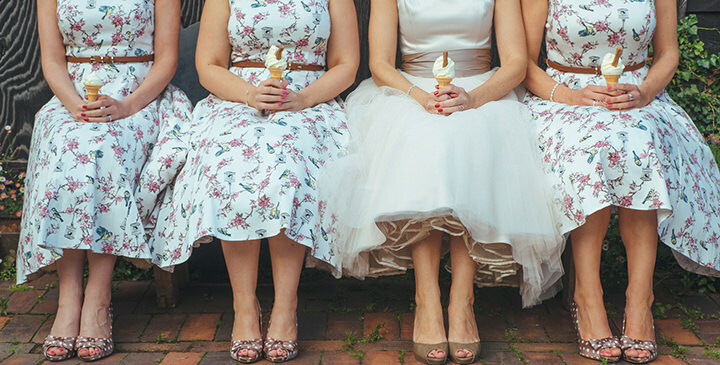 Both me and my bridesmaids all bought white pumps for the evening and barn dance from Primark. Harry wanted to dress like a country gent so he searched high and low for a vintage tweed suit. He found a 3 piece lambs wool tweed suit from Wholesale vintage clothing, based in Guildford and wore a cravat that belonged to my Grampie. My mum made him a pocket square to match as we couldn’t find one anywhere. His shoes were from M&S, socks from TK Maxx. He carried a cane with brass horses head which he found in a charity shop for £3. His wedding ring is Titanium and bought from Fraser Hart. 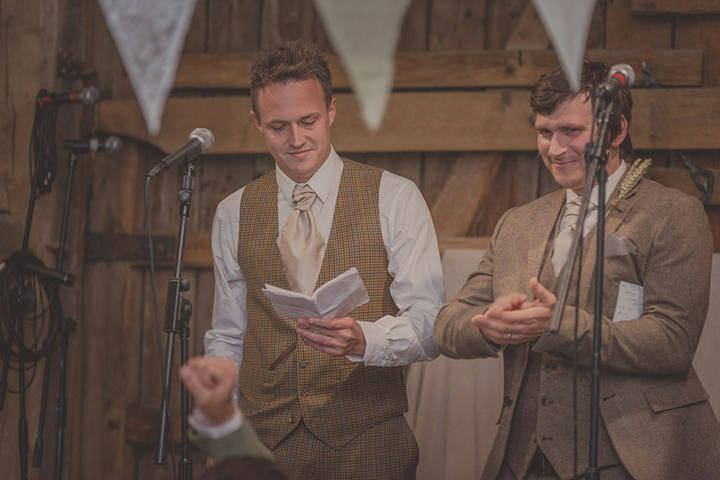 The 2 best men wore tweed suits, one bought on Ebay and the other from Topman.. We hired mocha cravats and pocket squares from Moss Bross. 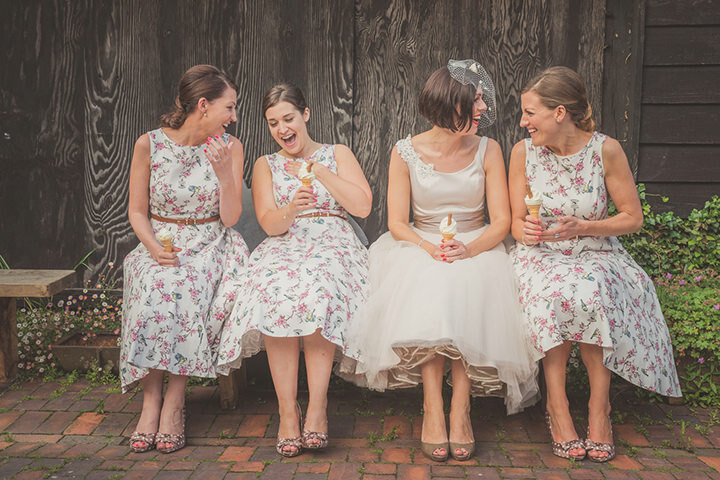 We bought the bridesmaid dresses online from Lady V London. The girls wore Audrey Hepburn style 1950’s style dresses in cream with a bird and blossom pattern.Their belts were from New Look. They wore mocha with white polka dot peep toe shoes from Phase Eight and each had a pair of white pump from Primark to wear for the barndance and into the evening. 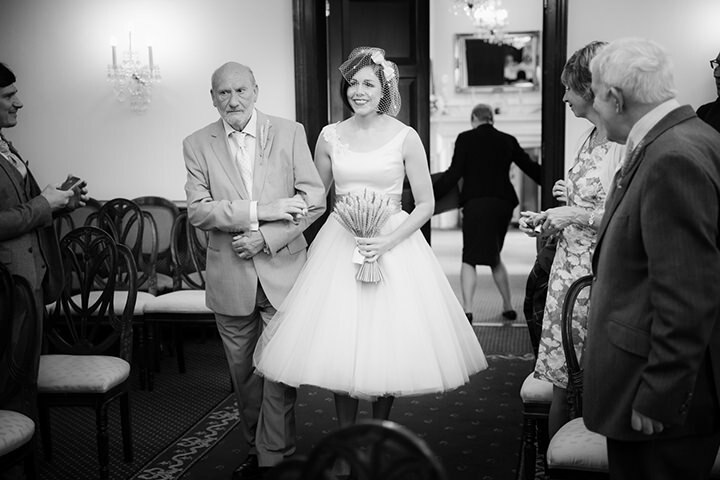 My daughter Poppy was a flower girl. She wore a cream lace and tulle dress from monsoon with a gold cardigan. Her white pumps were from Next. Natural colours, county feel/vintage. 1950’s to match my dress. 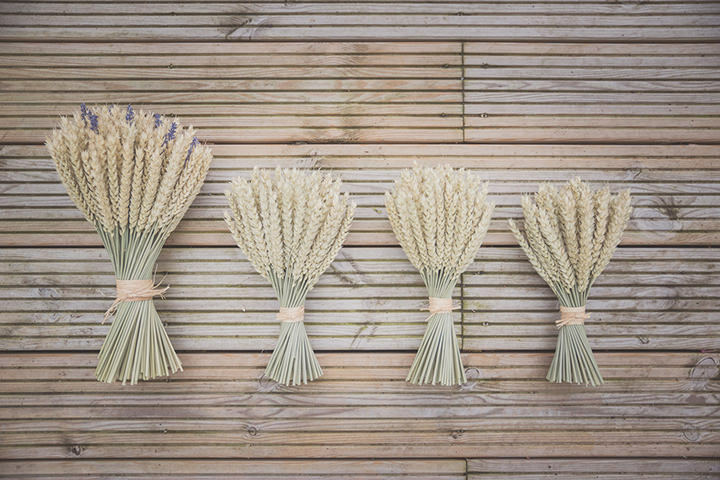 I had a hand tied bouquet of dried wheat and lavender, my bridesmaids had hand tied bouquets of wheat. We made the button holes ourselves. 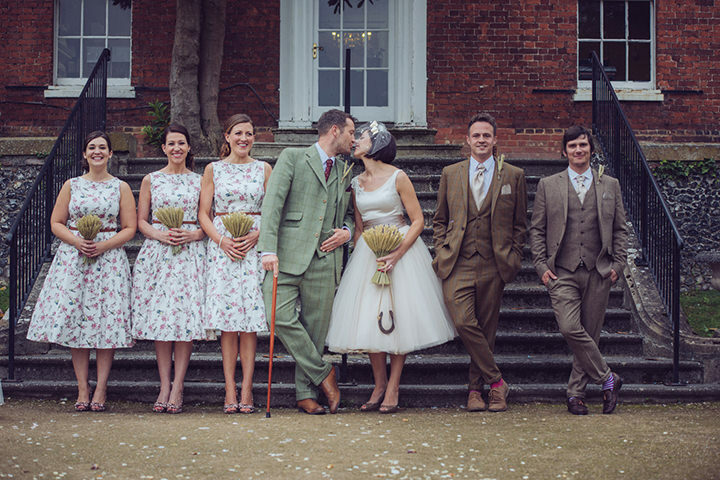 Harry’s button hole was dried lavender and wheat whilst all other wedding guests’ were made of wheat. 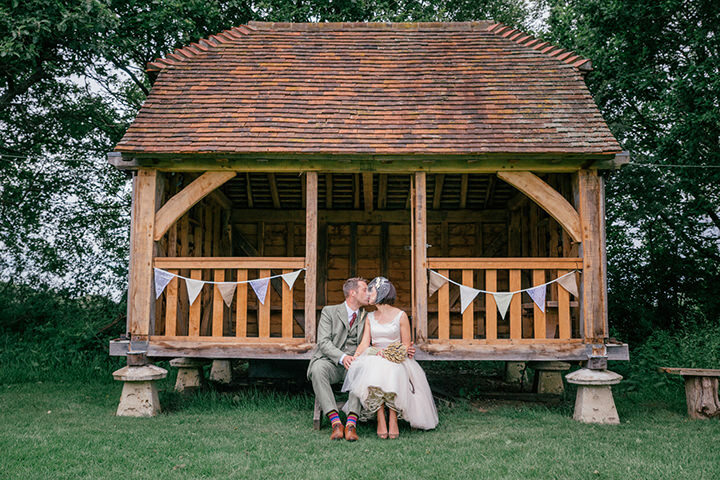 Gildings Barn was so beautiful itself we felt too much decoration would detract away from the stunning setting. 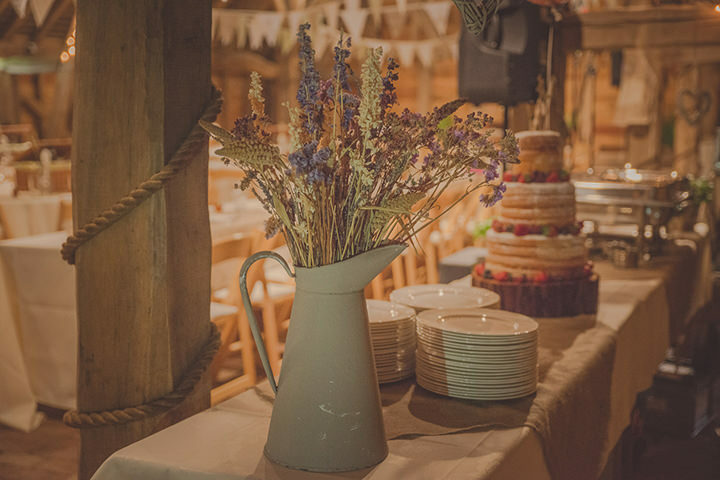 We wanted to make sure our decorations were also within keeping of the barn so we kept to natural colours and just simply had bunting and herbs placed around in large terracotta pots. The herbs (lemongrass, basil, mint, lavender) were grown by my mum and step dad. They made the barn smell lovely. 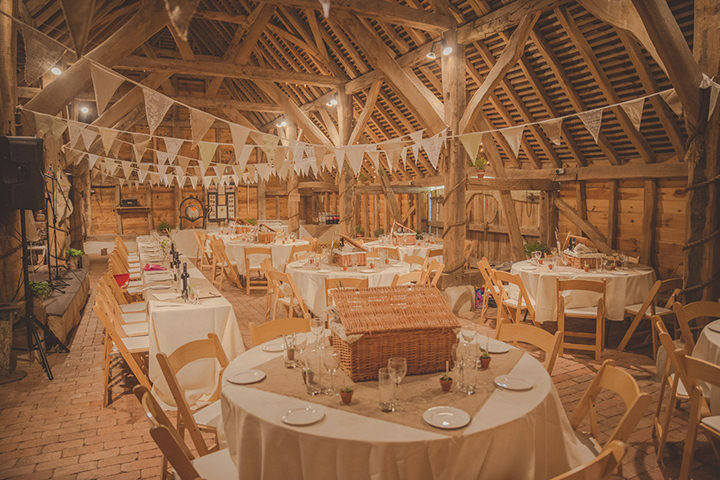 We hung rattan hearts around the barn from Primark. 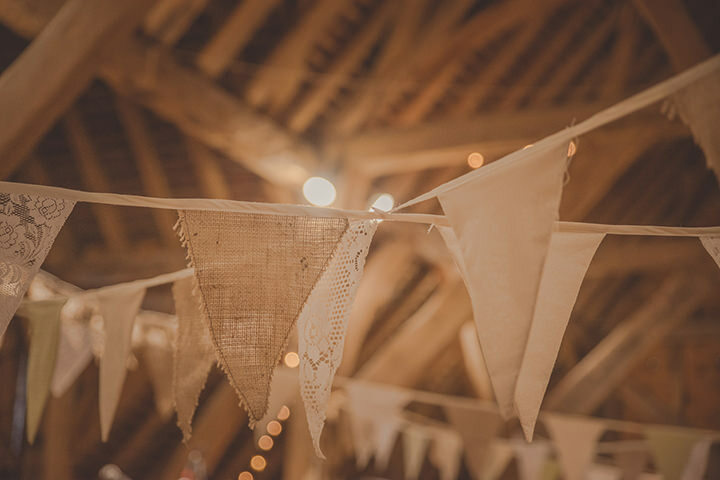 Bunting – Our mums worked tirelessly making 250 metres of bunting which decorated the barn. We used hessian, old lace curtains and pieces of material that we already had. 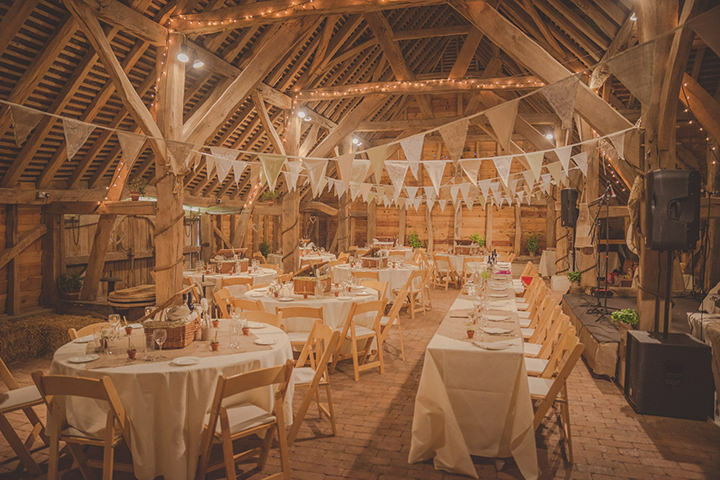 A family friend made a string of ‘Mr and Mrs Lynch’ bunting from hessian with lace writing which hung above the stage and behind the head table. A friend lent us a vintage tandem bicycle which we used for photographs.We made all the table decorations ourselves. Each table had a wicker picnic basket (bought from charity shops and car boot sales) which Harry’s mum made linings for. We put condiments, wine, cutlery, napkins etc in these. They formed the centre piece of the table. 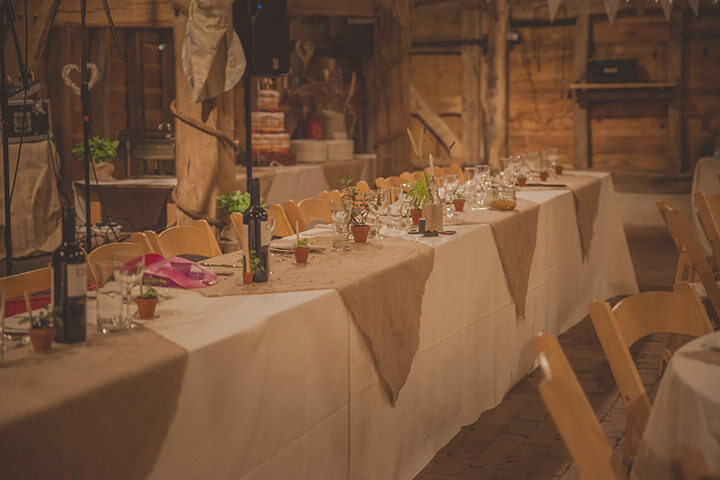 We made hessian slip clothes for each table top including the bar, cake table, sweetie table etc. We made heart shaped confetti from brown paper and sprinkled on each table. We wrapped hessian around glass bottles from IKEA and in each bottle we had a painted wooden spoon with a number on it. We added a couple of pieces of wheat and lavender to each. The individual place names were mini terracotta pots of herbs which my mum and stepdad also grew and a wooden sticks with each guests name on them. We wanted an informal meal with food that the majority of people enjoy. We chose a local caterer who provided the most amazing hog roast with jackets potatoes and freshly made salads and coleslaw. The hog roast also fitted in well with our country theme. The dessert consisted of our wedding cake and a selection of beautiful home made cakes baked by our guests. 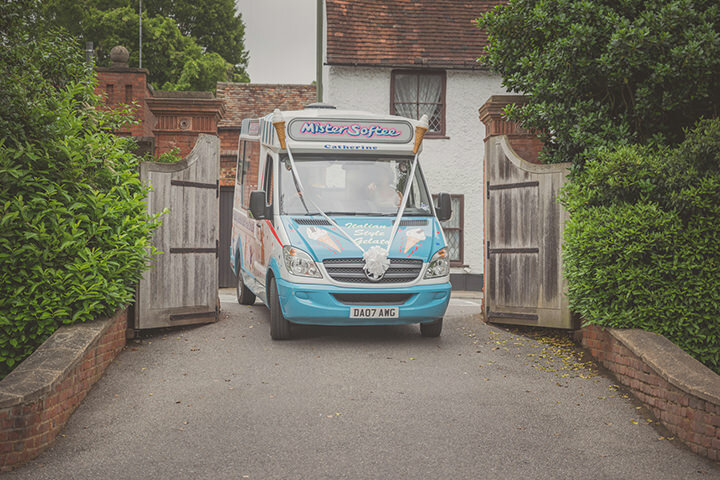 The ice cream van which took us to/from the wedding provided all our guests with an ice cream too. In the evening we had a selection of cheeses, ham, baguettes, crackers, pickles which we put together ourselves. We had a sweetie table which our guest could help themselves to throughout the day. This was made by a very good friend Millie. We has a 3 tier Victoria sponge dusted with icing sugar and decorated with summer berries (strawberries, raspberries, blueberries). We made the cake topper which was a string of bunting and a bride and groom spoon (which was meant to represent us! 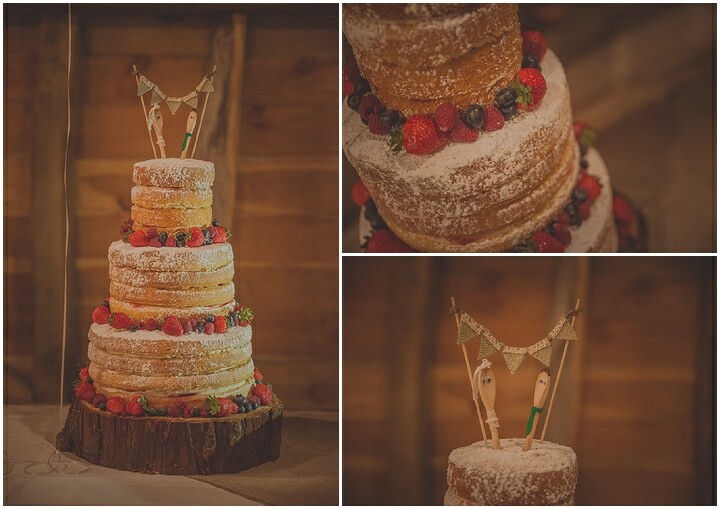 We found a local tree surgeon who cut us a slice of wood the right size to stand our cake on. As we were in a barn we just had to have a barn dance. 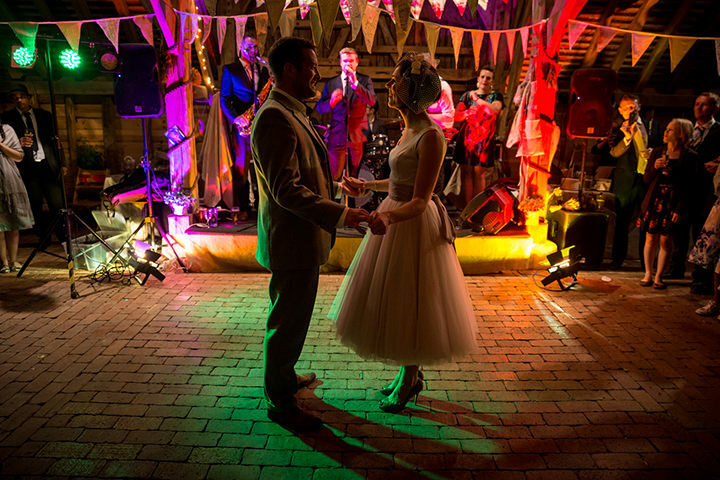 Its something we’ve always wanted to do and knew it would be something that all our guests (even those who don’t usually dance) would get up and have a go. It was great even though most of us were in a bit of a muddle most of the time everyone had such fun and it was a great way for guests to mix. We wanted something a little different. 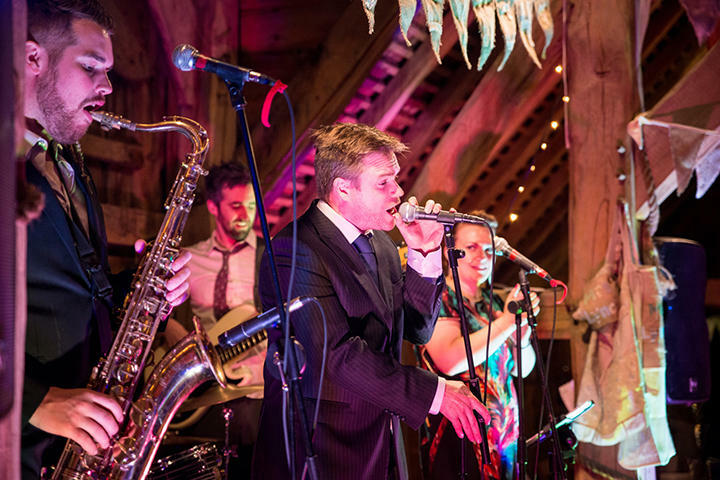 My brother Holley has his own band (the Brightside band) and so of course we wanted him to be part of the special day doing what he loves. It meant so much that he was also able to play our first dance. The band were amazing, they played a varied selection of music to dance to and even initiated a dance off! 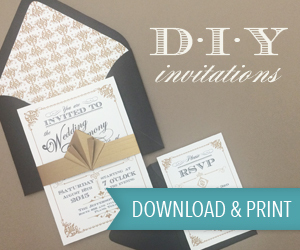 My brother Tone designed all the stationary and we got it printed online. 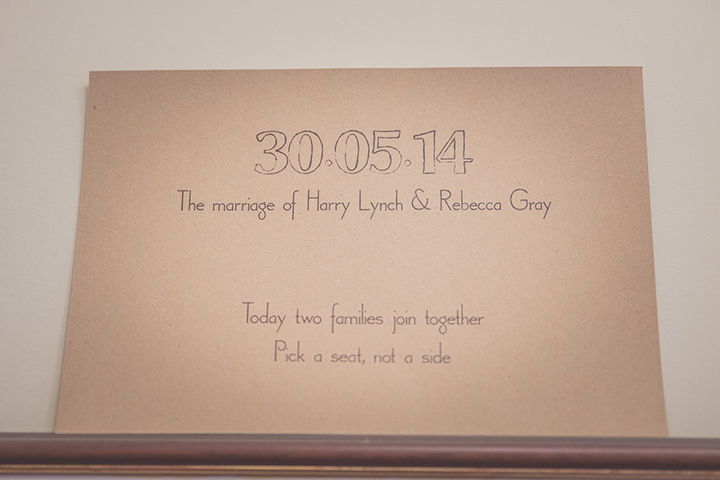 We wanted it all to be natural looking so we had it printed on brown Kraft paper. We wanted something informal and also a bit of fun. 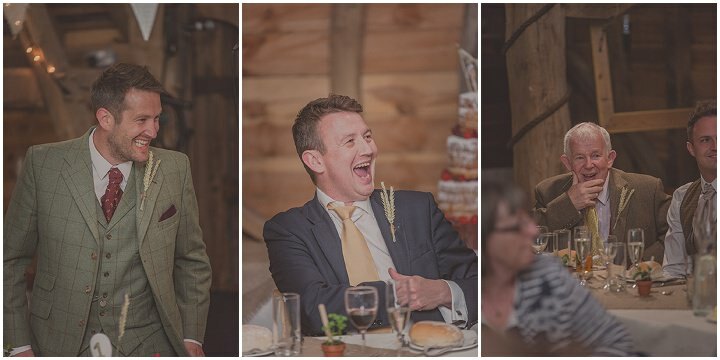 He chose an image of chicken and egg with ring inside it to reflect Harrys proposal.We asked our guests to write one word on their RSVP’s to describe the day (It’s going to be a ……… day) and also asked them to each draw a self portrait on the back which we then used as part of the decoration within the barn. We made almost everything ourselves, with the help of our family and friends to ensure everything was personal and also to keep costs down. This also meant on the day all our guests had played a huge part in making it even more special. We spend hours trawling charity shop, car boot sales and ebay for all the bits and pieces. The planning was so much fun. One of our themes which ran through the day was ‘Spoons’. Our nicknames are big and little spoon! Each birthday/Christmas/valentine’s day etc we give each other a spoon. We gathered together the spoons we have collected over the years and created a string of spoons to hang in the barn. The cake topper was spoons, the table plan was themed around spoons as were the table numbers. 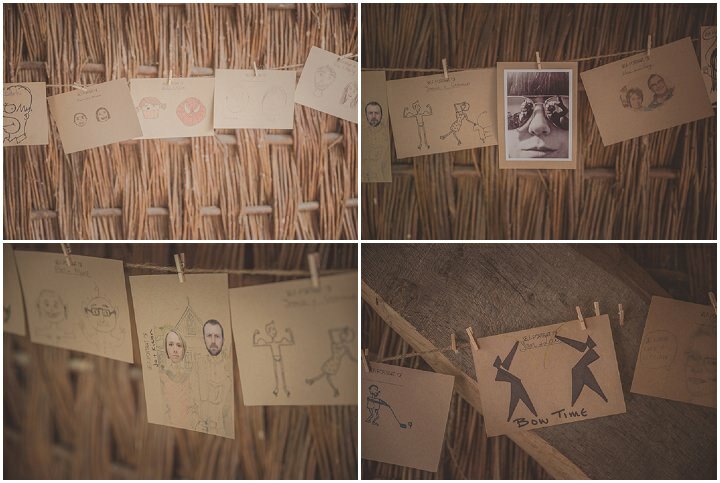 RSVP’s – We asked each of our guests to sketch a self portrait on the back of our RSVP’s and we pegged them all on a string and put it on display in the barn. – Stationary – Designed by my brother and printed online. – Place names – Tiny terracotta pots with herbs grown by my mum and stepdad, with a small wooden stick with their name hand written on by my best friend Anna. – Skittle Vodka – It’s a bit of a tradition to brew some skittle vodka for special occasions (skittles dissolve in vodka) so my best friend Anna brewed some for us for the day! – Ice Cream Van – Harry used to work as an ice cream man so one of my dreams was to have him serve me an ice cream from a van. 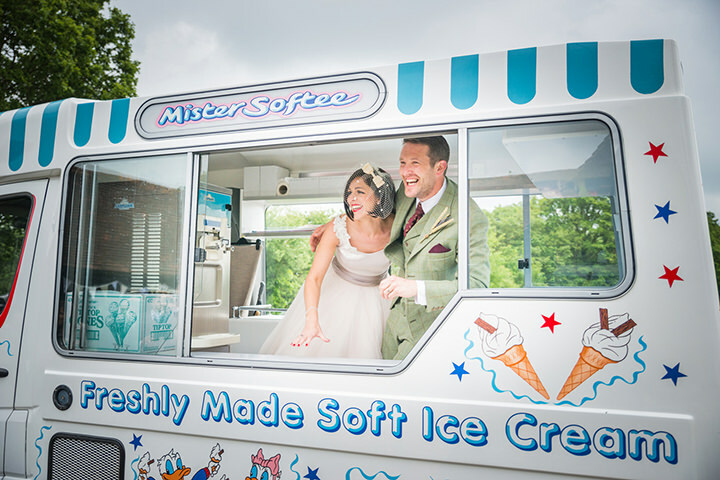 His dad organised for us to have the ice cream van as our wedding car, he served me that ice cream and the guests all had ice creams as part of the dessert. 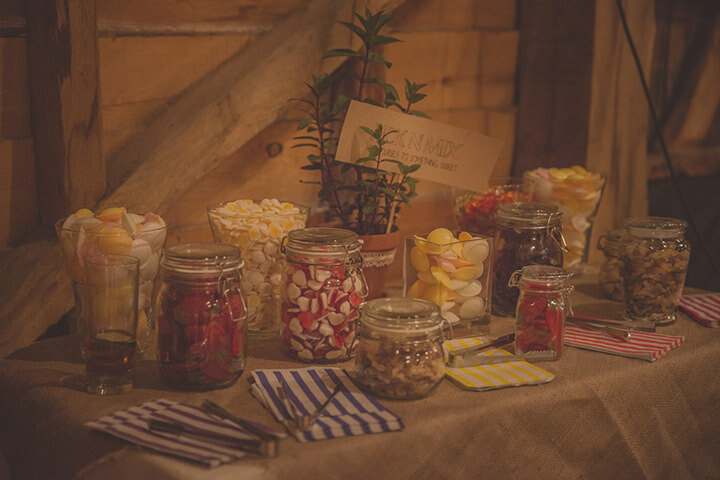 – Sweetie Table – we bought penny sweets from a wholesaler online and found various glass containers in charity shops to hold the sweets. – Photo booth – My brothers made a photo booth where guests could have their photos taken throughout the night. 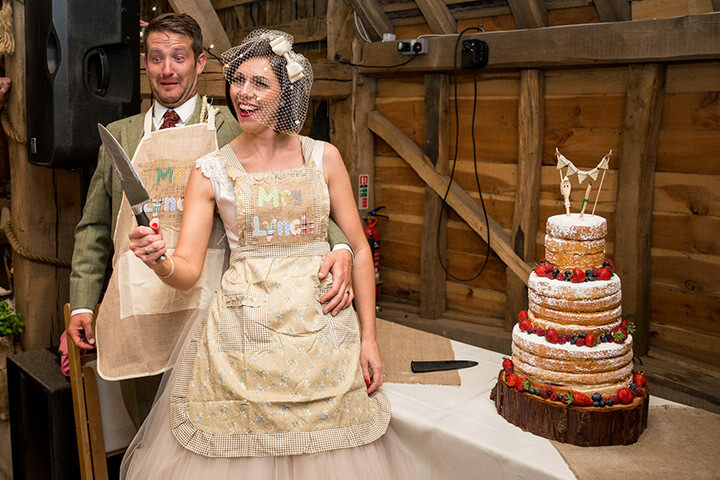 – Aprons – Home made aprons to wear whilst cutting the cake. 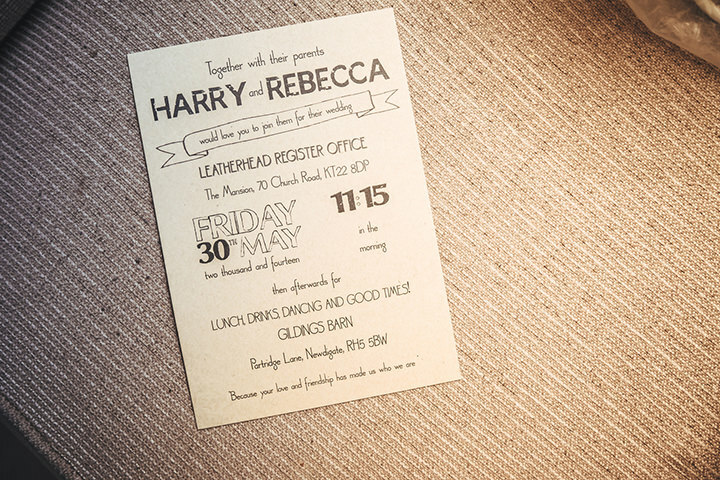 Mine was a 50’s style to match my dress and Harrys was made of hessian to match the decoration! – We punched out brown paper hearts for the table confetti. 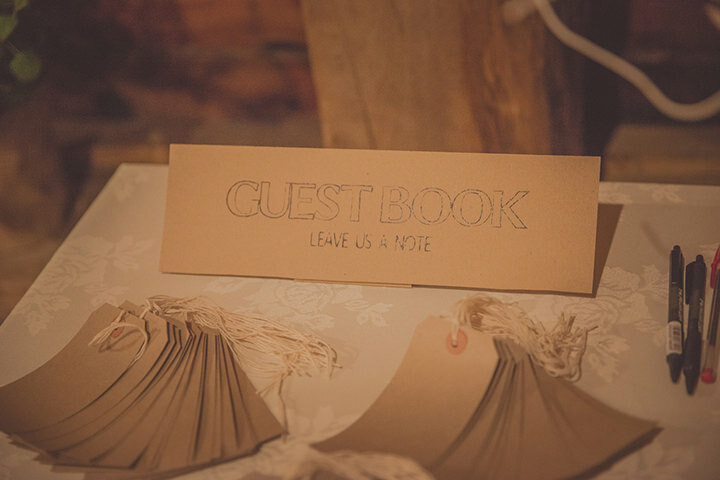 – Guest book was a white tree with fairy lights which we hung paper luggage tags on for the guests to write their messages. – Garden games – We bought various games from ebay which we had outside (Badminton, petanque, throw the horseshoe, giant jenga). 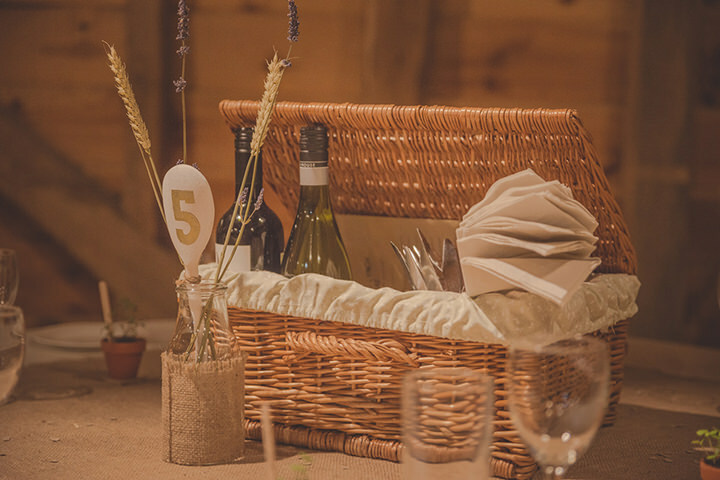 – Favours – We hid underneath each of our guest’s chairs a St Michael’s Hospice Lottery scratch card. My granny spent a number of weeks before she passed away in this hospice. They gave her and our family so much care we wanted to give them some thing little back. All proceeds went to the hospice. A few of our guests were winners too! Having our family and friends all around us having so much fun. Watching everyone smiling and laughing all day. When our 18 month old daughter Poppy carried a wooden garden trug containing our rings up the aisle to us. Having her there on such a special day made it even more perfect. 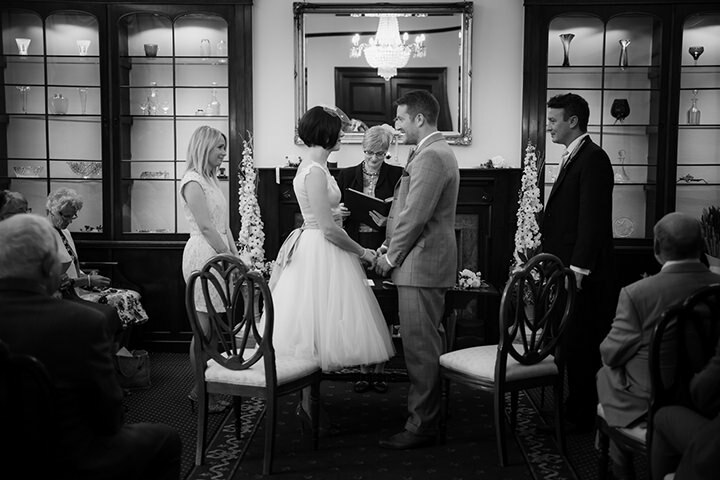 We wrote our own vows which we kept secret until the ceremony itself. When I arrived at the registry office with my step dad driving in an ice cream van (my wedding car!) and leaving in it with Harry. 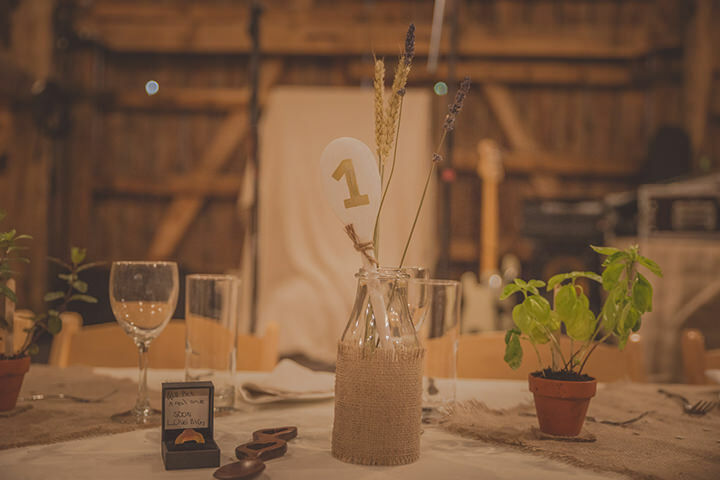 The best moment was when we played the music as we left the registry office and then when we arrived at the barn and were greeted by all our guests. 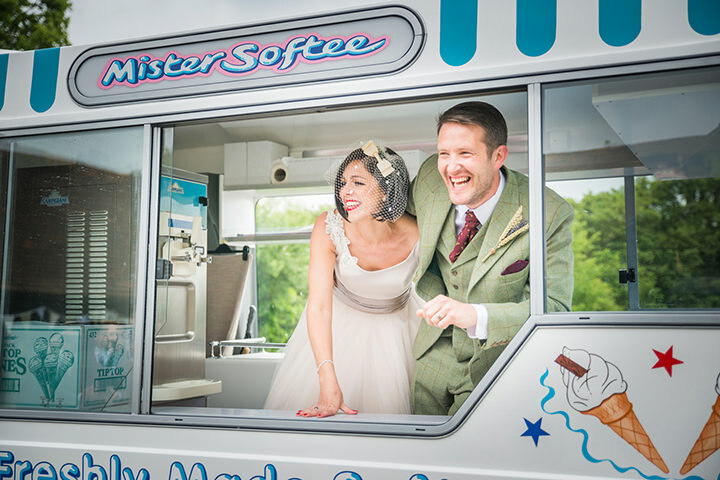 No one knew our wedding car would be an ice cream van! Taking part in the Barn dance was so much fun. Walking into the barn to the cheers and laughter of our family and friends. My best friend gave me a beautiful handkerchief with my name embroidered on it just as we left to go to the registry office as she knew I’d cry during the ceremony. My mum and auntie gave me my Granny’s beautiful vintage ring to wear. Harrys mum gave him his granddad pocket watch to wear. My two younger brothers (Holley and Tone) wrote and performed the most amazing rap (Hello Mrs Lynch) about me and Harry. They projected it onto a screen in the barn at the end of the evening. They even managed to edit in footage of us walking down the aisle of guests as they threw confetti on us! My two younger brothers (Holley and Tone) wrote and performed the most amazing rap (Hello Mrs Lynch) about me and Harry. They projected it onto a screen in the barn at the end of the evening. They even managed to edit in footage of us walking down the aisle of guests as they threw confetti on us! ( Video here on YouTube just in case you want a laugh). We both wrote our own wedding vows and kept them a secret until we said them to one another on the day. 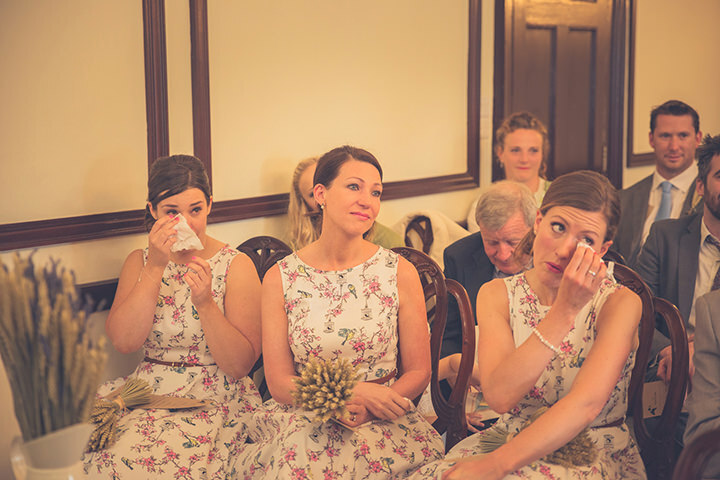 Both us and all our guests were in tears. 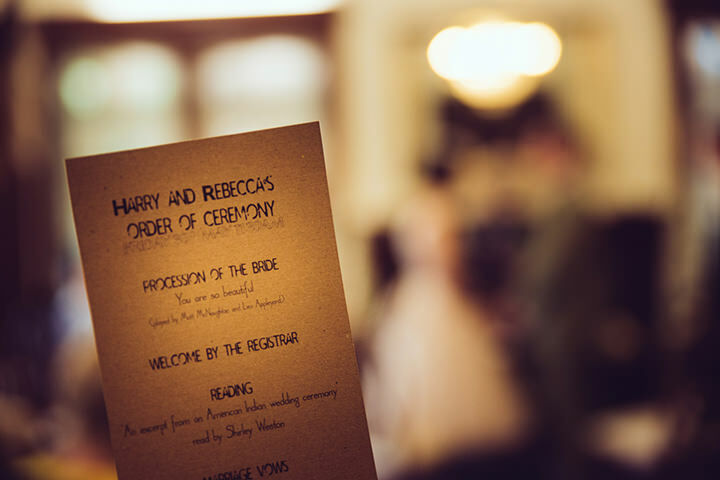 And one of Harry’s biggest surprises was seeing me walking down the aisle in my dress! Enjoy every minute as its all over so quickly. Take time out together at various points throughout the day. Stand back together and watch everyone having fun. A great tip from my brother. 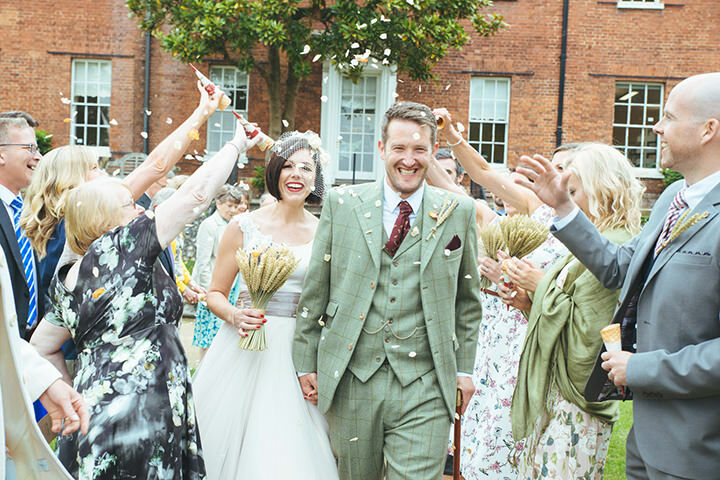 Walk really slowly down the aisle, enjoy looking at all your guests smiling back at you and just soak up the atmosphere as its over within a matter of seconds and you’ll only ever do it once in your life. 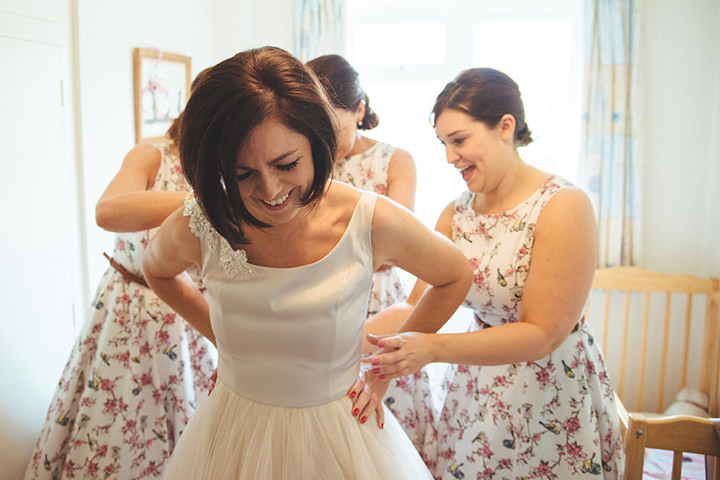 Pick your photographer carefully as your photos will be your memories forever Get all you friends and family involved in the planning. The personal touches make the day feel so much more special. 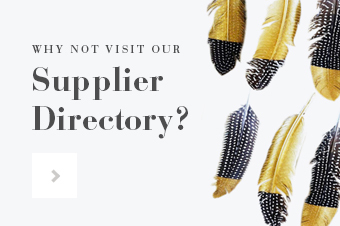 Catering – Chris Moon – [email protected] – 01293 863029. Chris was one of the nicest (and patient) guys we’ve ever met. The day would never have run so smoothly if it wasn’t for Chris. Nothing was too much trouble for him and his team, the food was outstanding and the service he gave us in the run up to the day and on the day was impeccable, over and above what we could ever have hoped for. My name is Tom Halliday and I’m based in a small market town called Saffron Walden, just outside of Cambridge. I shoot weddings all over the country, nowhere is too far. 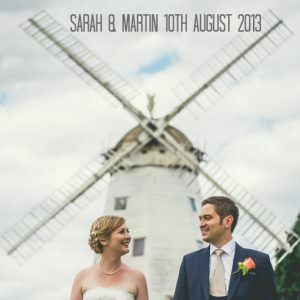 I am a Commercial Wedding Photographer, Photo Editor, lover of ale, and a massive camera geek. 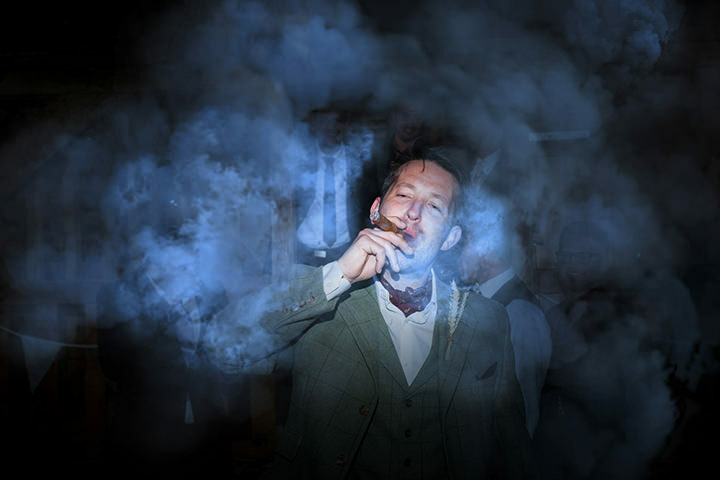 My style of wedding Photography is known as Commercial Wedding Photography. Throughout the day I also shoot reportage to make sure those beautiful once in a life time moments are captured. 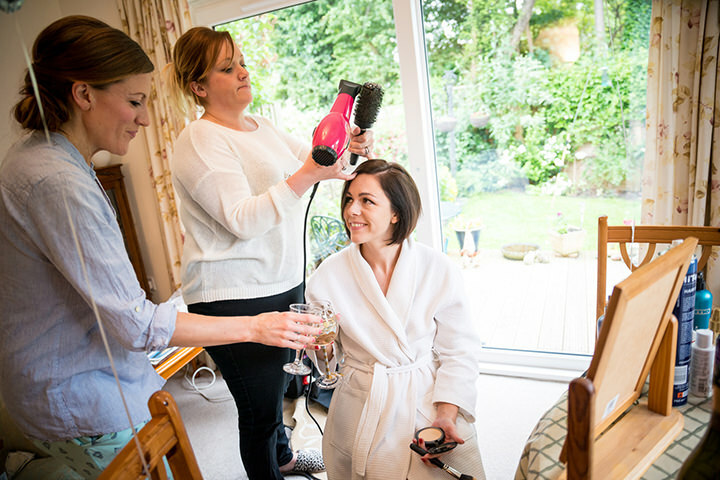 All images are professionally retouched to the highest standard. Tags: bunting, DIY, Candy Anthony, barn wedding, Burlap, tweed suit, ice cream van, Tom Halliday, 50s style wedding dess, LK Bennett.